Over the last few years I have been trying to make some lifestyle changes; eating healthier, exercising more consistently; teaching fitness classes; choosing better products for personal grooming and care. Now I am not a tree hugger by any stretch of the imagination but I am slowly making changes. And I have a friend who writes really long Facebook posts praising great services or products and berating the opposite. So I decided to write some posts reviewing what I think are great products. This tooth paste is one of them. I have read a fair bit about the controversy around fluoride, especially the type typically used in dental products. And reading a number of primal and paleo blogs, have read about making your own toothpaste with ingredients like coconut oil, baking soda, turmeric and more. 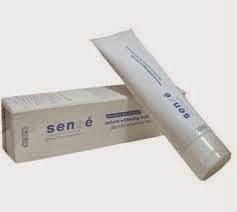 But my mother in law sells Usana and she uses this tooth paste so I asked her if she could get me one to try. I must be honest I loved it from the get go. It did take a bit of time to get conferrable with the concrete like appearance, but then it was not neon red, green or blue from artificial dyes and colors. The taste is light and mild. It is very effective and really is more whitening than either Crest or Colgate products I have used in the past. I love this toothpaste and the few times I ran out and was not restocked, with regret with each use returned to typical commercial products. The first time I had to use one I could not believe how unpleasant it was. This is a great product and believe it will be a benefit if you give it a try. Discover the natural way to a beautiful smile!" And it lives up to that!